Misha Didyk is one of opera’s most exciting tenors. He has appeared in the U.S.A. with the Metropolitan Opera as Andrei in Khovanshchina, the San Francisco Opera as Gherman in Pique Dame, Charles VII in The Maid of Orleans, des Grieux in Puccini’s Manon Lescaut and Ruggiero in La Rondine, the New York City Opera as Rodolfo in La Boheme and the Duke of Mantua, Opera Pacific as Rodolfo and Pinkerton, and Opera de Puerto Rico as Pinkerton. He made his U.S. debut with the Opera Company of Philadelphia, for whom he has sung the title role in Werther, the Duke of Mantua in Rigoletto, and Tebaldo in I Capuleti ed i Montecchi. In Europe, he has appeared at Teatro alla Scala, Milan, Opera de Lyon, and most recently with the Bavarian Radio Orchestra as Gherman,, Opera de Lyon and Deutsche Oper Berlin as des Grieux in Puccini’s Manon Lescaut, Gothenberg and Copenhagen as Werther, the title role in Don Carlo, and Cavaradossi in Tosca,, Teatro alla Scala, Opera de Lyon and the Deutsche Staatsoper as Alexey in The Gambler,.Teatro Real in Madrid as Dimitri in Boris Godunov , Vienna State Opera as Sergei in Lady Macbeth of Mtscnsk, Berne, Switzerland, Valencia, Spain, and Copenhagen as Pinkerton,and Liege as Carlo in I Masnadieri. This season, he will return to the U.S.A. as Cavaradossi at the Lyric Opera of Chicago. 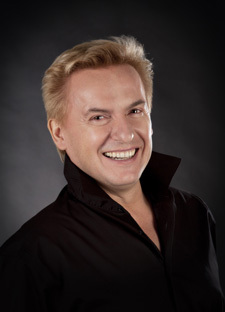 Mr. Didyk began his career in his native Ukraine as a soloist with the National Opera of Ukraine, where he sang Lensky in Eugene Onegin, Alfredo in La Traviata, the Duke in Rigoletto and Gherman in The Queen of Spades. Shortly afterward he began to receive invitations from the Bolshoi Theatre in Moscow and Mariinski Theater in St. Petersburg as Alfredo in La Traviata and made an impressive debut at the Finnish National Opera as Percy in Anna Bolena. Michael Didyk is a graduate of the National Academy of Music where he studied in the class of National Artist of the USSR Vassily Tretiak and National Artist of Ukraine Timokhin, and Professor Z. Lichtman, He has also studied with Professor Anna Maria Bondi at the Opera de la Bastille in Paris and with Eugenia Miroshnichenko, of the Ukraine’s most prominent singer. His solo recital was organized by the Delegation of the European Commission in Ukraine in February, 1998 at the National Philharmonia of Ukraine.